Blaise Pascal was a famous Philosopher from France, who lived between June 19, 1623 and August 19, 1662. He became only 39 years old. Blaise Pascal was a French mathematician, physicist, philosopher and religious writer, who laid the foundations of modern probability theory. As Pascal thinks belonged to the Cartesian school - he shared the René Descartes' dualistic view of body and soul, and the mechanical his explanation of the body. Pascal was born in Clermont-Ferrand, but moved seven years old Paris, with its highly educated father. Pascal was early ripe, and had an early reputation as an independent mathematician. 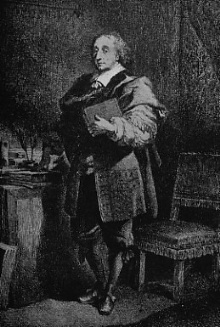 Pascal invented and built mechanical calculators. After an accident in 1640 he underwent a profound religious conversion, which he continued to his father and sister, Jacqueline, who became a nun at Port-Royal at Versailles. Through her ​​came Blaise Pascal in contact with jansenittene, and was strongly influenced by their strict religiousness. Through his Lettres Provinciales from 1650's Pascal made ​​an important contribution to French literature. These letters are both stylistically impressive, with the use of clever repartee and satire, and content important to Catholics. His Thoughts from 1670 is also an important and central book. He is born under the zodiac gemini, who is known for Communication, Indecision, Inquisitive, Intelligent, Changeable. Our collection contains 94 quotes who is written / told by Blaise, under the main topics: Faith, Happiness, Inspirational, Patriotism, Religion. "Concupiscence and force are the source of all our actions; concupiscence causes voluntary actions, force involuntary ones"
"Can anything be stupider than that a man has the right to kill me because he lives on the other side of a river and his ruler has a quarrel with mine, though I have not quarrelled with him?" "Chance gives rise to thoughts, and chance removes them; no art can keep or acquire them"
"Continuous eloquence wearies. Grandeur must be abandoned to be appreciated. Continuity in everything is unpleasant. Cold is agreeable, that we may get warm"
"Contradiction is not a sign of falsity, nor the lack of contradiction a sign of truth"
"Custom is our nature. What are our natural principles but principles of custom?" "Desire and force between them are responsible for all our actions; desire causes our voluntary acts, force our involuntary"
"Do you wish people to think well of you? Don't speak well of yourself"
"Earnestness is enthusiasm tempered by reason"
"Eloquence is a painting of the thoughts"
"Even those who write against fame wish for the fame of having written well, and those who read their works desire the fame of having read them"
"Evil is easy, and has infinite forms"
"The strength of a man's virtue should not be measured by his special exertions, but by his habitual acts"
"Man is but a reed, the most feeble thing in nature, but he is a thinking reed"
"If we examine our thoughts, we shall find them always occupied with the past and the future"
"People are generally better persuaded by the reasons which they have themselves discovered than by those which have come in to the mind of others"
"If all men knew what others say of them, there would not be four friends in the world"
"If man made himself the first object of study, he would see how incapable he is of going further. How can a part know the whole?" "Law, without force, is impotent"
"If you gain, you gain all. If you lose, you lose nothing. Wager then, without hesitation, that He exists"
"Love has reasons which reason cannot understand"
"The sensitivity of men to small matters, and their indifference to great ones, indicates a strange inversion"
"Truth is so obscure in these times, and falsehood so established, that, unless we love the truth, we cannot know it"
"I maintain that, if everyone knew what others said about him, there would not be four friends in the world"
"The last act is bloody, however pleasant all the rest of the play is: a little earth is thrown at last upon our head, and that is the end forever"
"The present letter is a very long one, simply because I had no leisure to make it shorter"
"Too much and too little wine. Give him none, he cannot find truth; give him too much, the same"
"Faith certainly tells us what the senses do not, but not the contrary of what they see; it is above, not against them"
"Faith embraces many truths which seem to contradict each other"
"Faith indeed tells what the senses do not tell, but not the contrary of what they see. It is above them and not contrary to them"
"Faith is different from proof; the latter is human, the former is a Gift from God"
"Few friendships would survive if each one knew what his friend says of him behind his back"
"Habit is a second nature that destroys the first. But what is nature? Why is habit not natural? I am very much afraid that nature itself is only a first habit, just as habit is a second nature"
"Happiness is neither without us nor within us. It is in God, both without us and within us"
"He that takes truth for his guide, and duty for his end, may safely trust to God's providence to lead him aright"
"Human beings must be known to be loved; but Divine beings must be loved to be known"
"I can well conceive a man without hands, feet, head. But I cannot conceive man without thought; he would be a stone or a brute"
"Imagination disposes of everything; it creates beauty, justice, and happiness, which are everything in this world"
"In each action we must look beyond the action at our past, present, and future state, and at others whom it affects, and see the relations of all those things. And then we shall be very cautious"
"In faith there is enough light for those who want to believe and enough shadows to blind those who don't"
"It is good to be tired and wearied by the futile search after the true good, that we may stretch out our arms to the Redeemer"
"It is incomprehensible that God should exist, and it is incomprehensible that he should not exist"
"It is natural for the mind to believe and for the will to love; so that, for want of true objects, they must attach themselves to false"
"It is not good to be too free. It is not good to have everything one wants"
"It is the fight alone that pleases us, not the victory"
"It is the heart which perceives God and not the reason. That is what faith is: God perceived by the heart, not by the reason"
"Jesus is the God whom we can approach without pride and before whom we can humble ourselves without despair"
"Man's true nature being lost, everything becomes his nature; as, his true good being lost, everything becomes his good"
"Men are so necessarily mad, that not to be mad would amount to another form of madness"
"Men blaspheme what they do not know"
"Men despise religion. They hate it and are afraid it may be true"
"Men never do evil so completely and cheerfully as when they do it from religious conviction"
"Men often take their imagination for their heart; and they believe they are converted as soon as they think of being converted"
"Nature is an infinite sphere of which the center is everywhere and the circumference nowhere"
"Noble deeds that are concealed are most esteemed"
"Nothing fortifies scepticism more than the fact that there are some who are not sceptics; if all were so, they would be wrong"
"Nothing gives rest but the sincere search for truth"
"That we must love one God only is a thing so evident that it does not require miracles to prove it"
"The charm of fame is so great that we like every object to which it is attached, even death"
"The consciousness of the falsity of present pleasures, and the ignorance of the vanity of absent pleasures, cause inconstancy"
"The eternal silence of these infinite spaces frightens me"
"The finite is annihilated in the presence of the infinite, and becomes a pure nothing. So our spirit before God, so our justice before divine justice"
"The gospel to me is simply irresistible"
"The greater intellect one has, the more originality one finds in men. Ordinary persons find no difference between men"
"The greatness of man is great in that he knows himself to be wretched. A tree does not know itself to be wretched"
"The heart has its reasons of which reason knows nothing"
"The immortality of the soul is a matter which is of so great consequence to us and which touches us so profoundly that we must have lost all feeling to be indifferent about it"
"The supreme function of reason is to show man that some things are beyond reason"
"The weather and my mood have little connection. I have my foggy and my fine days within me; my prosperity or misfortune has little to do with the matter"
"There are only two kinds of men: the righteous who think they are sinners and the sinners who think they are righteous"
"There are some who speak well and write badly. For the place and the audience warm them, and draw from their minds more than they think of without that warmth"
"There are two kinds of people one can call reasonable: those who serve God with all their heart because they know him, and those who seek him with all their heart because they do not know him"
"There is a God shaped vacuum in the heart of every man which cannot be filled by any created thing, but only by God, the Creator, made known through Jesus"
"Through space the universe encompasses and swallows me up like an atom; through thought I comprehend the world"
"Thus so wretched is man that he would weary even without any cause for weariness... and so frivolous is he that, though full of a thousand reasons for weariness, the least thing, such as playing billiards or hitting a ball, is sufficient enough to amuse him"
"Time heals griefs and quarrels, for we change and are no longer the same persons. Neither the offender nor the offended are any more themselves"
"To have no time for philosophy is to be a true philosopher"
"We never love a person, but only qualities"
"We only consult the ear because the heart is wanting"
"We run carelessly to the precipice, after we have put something before us to prevent us seeing it"
"We sail within a vast sphere, ever drifting in uncertainty, driven from end to end"
"We view things not only from different sides, but with different eyes; we have no wish to find them alike"
"When we are in love we seem to ourselves quite different from what we were before"
"When we see a natural style, we are astonished and charmed; for we expected to see an author, and we find a person"
"Words differently arranged have a different meaning, and meanings differently arranged have different effects"
"You always admire what you really don't understand"
"A trifle consoles us, for a trifle distresses us"
"All human evil comes from a single cause, man's inability to sit still in a room"
"All men's miseries derive from not being able to sit in a quiet room alone"
"All of our reasoning ends in surrender to feeling"
"As men are not able to fight against death, misery, ignorance, they have taken it into their heads, in order to be happy, not to think of them at all"
"Atheism shows strength of mind, but only to a certain degree"
"Belief is a wise wager. Granted that faith cannot be proved, what harm will come to you if you gamble on its truth and it proves false? If you gain, you gain all; if you lose, you lose nothing. Wager, then, without hesitation, that He exists"
"Between us and heaven or hell there is only life, which is the frailest thing in the world"